A few thunderstorms this evening. Mostly clear skies late. Low near 50F. Winds NW at 10 to 15 mph. Chance of rain 40%..
A few thunderstorms this evening. Mostly clear skies late. Low near 50F. Winds NW at 10 to 15 mph. Chance of rain 40%. From left: Mallorie McKinney, Tayla Osborne, Kayla Mays, TaKhyra Jones, Alyssa Smith and Abby Cash. From left: Colton Byrd, Dagger Bishop, Andrew Walker, Gabbie Holt, Ryan Eubanks, Allan Pineda and Josiah Jowers. The A Team placed second and the B Team placed fourth in a field of 10 teams. Mallory Williams won the award for Best Witness. The A Team advanced to the state competition held in Lafayette on Saturday, March 30. 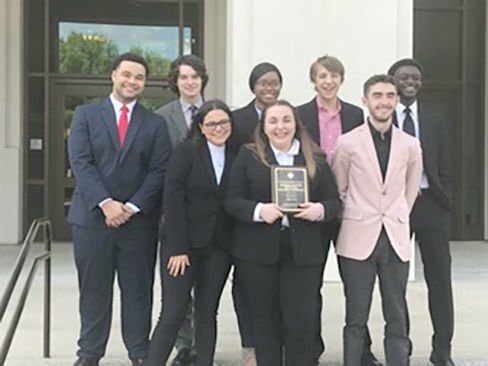 At that competition, Magi Sumpter won the award for Best Attorney from a field of more than 45 students. The teams are coached by Mitzi Murray.